This year was one of my favorite years ever. We have met so many amazing people through playing shows with folks, and traveling around. Sending a huge thanks to all the people who played shows with us/set up shows/let us crash on your couches. I can't wait to be back on the road but in the meantime, we're going to be practicing our asses off writing more material, and maybe buying even more bass amps for future tours. Because I can't seem to get this cello loud enough. PS We actually do have one more show before we take a break till March- it'll be in Chicago at Ian's Party. We play the Chop Shop at around 9 this Saturday (January 6th). See you in the windy horrifyingly chilly city???? 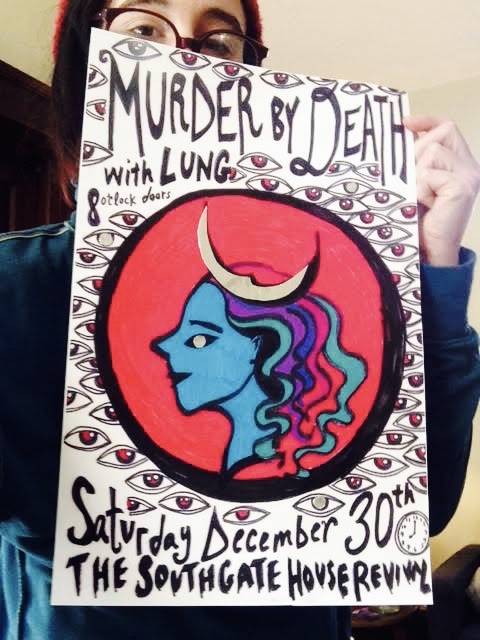 opening up for Murder by Death! Such. a. good. time.